We Treat Your Dogs Like Our Own! All dogs must have their vaccinations up to date including kennel cough. Proof will be required before the start of the stay. I am 43 and have had dogs all my life. I have a lot of time on my hands and enjoy the company of dogs 24/7. 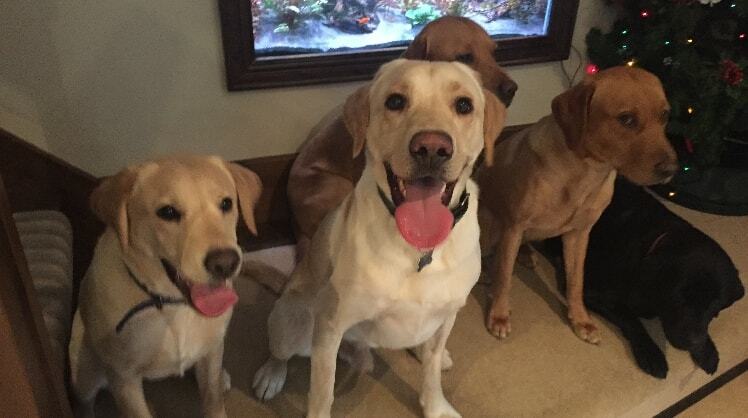 I am a breeder of Fox Red Labradors, and have several of my own. I couldn't deal with the thought of any of my pups going into concrete boarding kennels, and offered all my customers the facility of bringing the dogs back here to be looked after while they were away on holiday. One thing led to another and with word of mouth ...things grew into me offering my home and services to people who hadn't bought their dog off me. Your dog will be loved and treated like my own are, they have a safe dog friendly enviroment to lounge around indoors and have acres to run about outside and in my purpose built 12500sq ft fenced dog play area with close supervision, and access to 4000 acres of parks, lakes and rivers on our doorsteps for proper walks and play with my own dogs. Your dogs will love their time here and will enjoy coming back for a holiday any time you have to leave them. Mark is an utterly top-notch host and minder for Whizz. Hugely recommended.